TeSys D thermal overload relays - pre-wiring kit of NC contact. Product or component type: Pre-wired connector. Electronic overload relay for motor TeSys - 0.3...1.5 A - 24 V AC/DC. Thermal protection adjustment range: 0.3...1.5 A. Electronic overload relay for motor TeSys - 0.3...1.5 A - 48 V AC/DC. Thermal protection adjustment range: 0.3...1.5 A. Electronic overload relay for motor TeSys - 0.3...1.5 A - 100...120 V AC. Thermal protection adjustment range: 0.3…1.5 A. 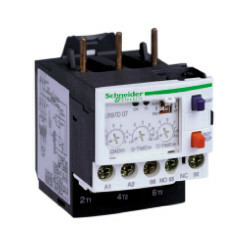 Electronic overload relay for motor TeSys - 0.3...1.5 A - 200...240 V AC. Thermal protection adjustment range: 0.3…1.5 A. Electronic overload relay for motor TeSys - 1.2...7 A - 24 V AC/DC. Thermal protection adjustment range: 127 A. Electronic overload relay for motor TeSys - 1.2...7 A - 48 V AC/DC. Thermal protection adjustment range: 127 A.